When I reflect on our travels through Bangladesh, there is one image that stands out above all others: the image of a brightly coloured rickshaw, elaborately painted and decorated from top to toe. 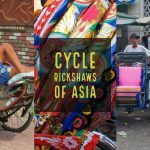 The cycle rickshaw is one of Asia’s most iconic images and this is particularly so in Bangladesh. There are an estimated one million plus rickshaws peddling the streets; over half of them in the capital, Dhaka, and almost all of them colourful works of art! It is believed that cycle rickshaws have been in Bangladesh since the 1940s but the colourful embellishments didn’t start appearing until the ’60s. One of the main features of rickshaw art is the back ‘number plate’ area between the two wheels that tends to depict a popular scene. Themes include film stars, the Taj Mahal, rural country villages and animals, with peacocks, doves, elephants and tigers favoured. The artwork can also take on a political theme and during Bangladesh’s fight for separation from Pakistan in the early ’70s, rickshaws featured patriotic images including one of an astronaut planting the Bangladesh flag on the moon! In more recent times Osama Bin Laden has been featured. An interesting backboard certainly provides something to look at when stuck in Old Dhaka traffic, ‘bumper to bumper’ with the rickshaw in front. Rickshaw art covers the entire rickshaw, not just the backboard, including the rear side panels, mud guards and flaps and the bicycle frame. The padded passenger seat also sports bright paintings and the hoods have faux-leather cut-outs appliquéd on to them. A final touch is often a set of brass vases replete with plastic or paper flowers along the top of the handlebars. It’s important for a rickshaw to look as attractive as possible in order to catch the eye of any potential customers. With over 7 million rickshaw trips being made daily in Dhaka, covering a combined distance of 11 million miles, the competition is tough! 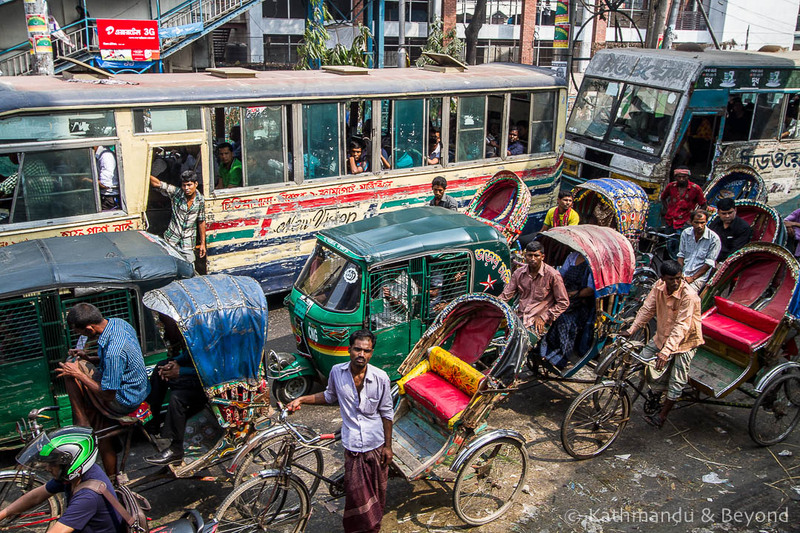 Rickshaws account for more than half of the vehicles on Dhaka’s roads and 70% of their passengers and thus have a significant impact on the economy. In the capital, around three-quarters of a million people work in a sector related to the rickshaw industry. As well as the incomes earned by rickshaw drivers and owners and the rickshaw artists, makers and repairers, imagine the number of cups of tea that are sold from the roadside stalls set up solely to cater for the rickshaw industry! Our guidebook pointed us towards Old Dhaka’s Bangshal Street as the place to see rickshaws being made. Bangshal Street translates as bicycle street but today it should be renamed motorbike street as that’s what most of the shops now sell, along with go-faster stickers and other items to decorate a more modern form of transport. We were disappointed not to find alleyways packed with rickshaw makers but we did find a few shops selling rickshaw art and other decorative items. There was one guy who told us he also made superior quality rickshaw art purely to sell to the tourists who came looking for it. At four times the price of a standard piece, it was still cheap. We did find a rickshaw maker in the town of Rajshahi and watched him work for a while. He was busy fitting spokes to a wheel when we passed by, but rickshaws in various stages of completion surrounded him. And inside his small workshop, the walls were covered with his rickshaw artwork. Note you can click on any of the above collages to view as a slideshow. 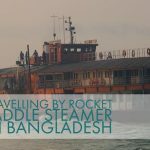 More of our photographs of Bangladesh including quite a lot that don’t feature rickshaw art can be viewed in our Bangladesh photo gallery. This is an interesting three-minute film from the BBC’s website about the life of a rickshaw artist. I just wonder if there is a slight mis-translation by the narrator because the painter is reported saying he charges US$200 for a painting for the back of a rickshaw. We paid not much more than 200 taka for a piece of rickshaw artwork from one of the workshops in Old Dhaka, that’s more like US$2.50! What makes the two hundred dollar price-tag even more unlikely is the fact that the average daily earnings of a rickshaw driver are around US$2.50, and most don’t own their own rickshaw. And if you do want to buy a piece of rickshaw art without going all the way to Bangladesh, you can do so from Rickshaw Art in Bangladesh. 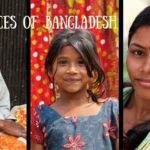 Read more of our posts featuring Bangladesh here. 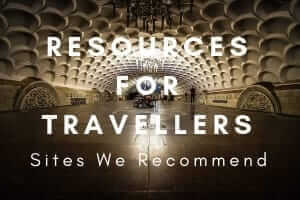 And if you enjoyed this post, you’ll probably also like Auto Rickshaws Around the World and Cycle Rickshaws: An Asian Icon. Great photos, and a very interesting story about them. I think I recognized in a couple of the photos a rickshaw we spotted in a little village outside Srimangal. And I think you are right about the $200 for a painting of a Taj Mahal being a mistranslation. Earlier in the story the translator has the painter saying he makes $200-300 per month. So, along with the reason you gave (the 200 taka you paid), no way he gets $200 for one painting. Beautiful pictures! I love how colourful these rickshaws are – changes the whole landscape! Thank you. They certainly brighten up the streets of Dhaka and distract you from the chaos!